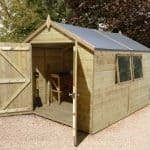 While we love a good wooden shed here at WhatShed, we also like to make sure that you folks know that there is actually quite a lot of variety out there and you do not always have to have a shed or workshop made from wood. Well, with that in mind, we are looking at metal shed specialists, Absco Sheds today and putting them through their paces to see just what makes this such a popular brand. By the end of our Absco Sheds review, we are certain that you will know if this is the brand for you. Absco Sheds have a pretty interesting back story in that they are not actually a UK brand. This is an Australian company who operate out of Brisbane, Australia. These are one of the more long running shed brands in the whole of Australia, as they have been making their metal sheds for over 25 years now. Even though they are based overseas, there are still a good number of UK retailers who sell their products, such as Shed Store and Tesco. Absco Sheds: What Kind Of Products Are In The Absco Sheds Range? 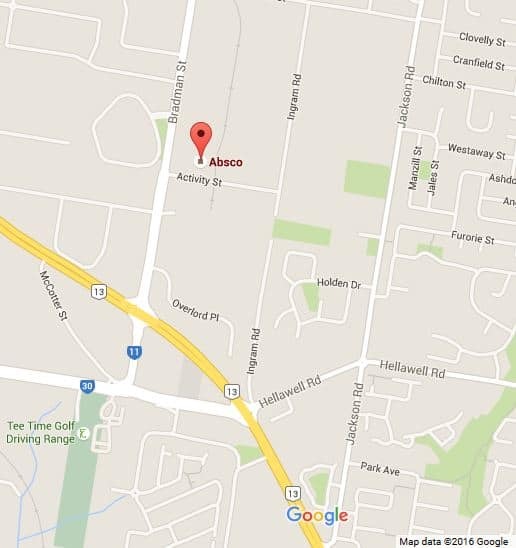 As you may have guessed from our intro, metal sheds are what the Absco Sheds range is all about. Actually, it is super strength steel that they like to say their products are made from and this certainly does make them something different from all the other shed brands out there as they do not sell any kinds of wooden sheds or other structures at all. So what kind of products are in this awesome range? Well, they have a great selection of storage sheds. These are in different series such as their more budget priced Space Saver range, all the way up to their Premier range of sheds. While they do not have the largest selection of sheds, we feel that there is more than enough here so no matter what kind of shape, size or price you are looking for, there will be an Absco Shed to suit your need. Another speciality of this brand is their garages. They have a fantastic selection of metal garages which are ideal for those of you who do not want to have to pay a contractor to build one from bricks and wood. 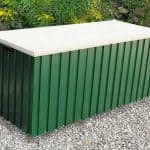 There are a few other products in the Absco Sheds range, such as their carports and patio covers which can give your decking or car a little bit of protection from the elements. Also they have a couple of more unusual products as well. They have a series of aviaries which can be used for a chicken coop, or a place to keep animals. The last product that they have is not something we see being required here in the UK, and that is a series of pool pump covers. But hey, if you are lucky enough to have a pool here in the UK and you like to use it in the two weeks of summer we get a year, at least you can purchase a great storage box to keep it out of sight and safe. 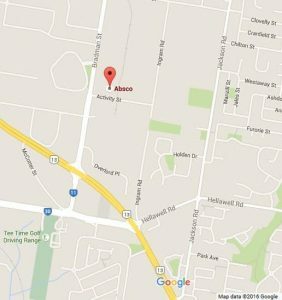 Absco Sheds: How Is The Quality? When it comes to quality, we are very impressed with the Absco Sheds line. Honestly we are having a real hard time coming up with any issues with the quality of these sheds and the other products they have. The reason for this is that they are mainly made from this incredible super strength steel. This stuff is so strong and robust that even Superman would have a hard time doing some damage to it. Speaking of damage, these products are designed to take a lot of abuse from the weather and from you when one of your DIY projects does not go to plan and you toss a wrench across the shed. These are made to last, and the fact that when you deal with Absco Sheds direct, you are getting a 30 year guarantee, shows you just how much faith Absco Sheds have in their products. 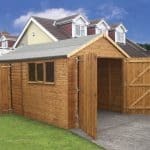 We have been reviewing sheds for long enough to know if a company is giving you a guarantee like this, then they must be very impressively robust products they are selling. One thing they mention is that their products are able to withstand wind of close to 100 mph which again goes to show the quality of these products and it should prevent your shed from landing in the land of Oz if we get really bad wind. When talking about the quality, we feel we must mention that one of the big benefits of purchasing an Absco Shed is that they are very easy to install. They have a patented, SNAPTiTE technology that does away for a million screws and bolts and literally sees the products just snap together in most places, Absco Sheds estimate that this SNAPTiTE technology can make installing one of their sheds up to 80 percent quicker than a standard shed. Also the materials used make these pretty much maintenance free, which is sure to be a huge bonus for many of you. Absco Sheds: How Are The Products Priced? 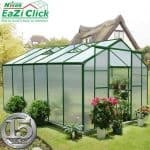 With how impressed we were with the quality of the products, we are sure that you are expecting that only people with a bank account similar to Bill Gates will be able to afford an Absco Shed or garage, but actually we feel that the prices they are asking are actually very reasonable, especially when you consider the quality of these products. 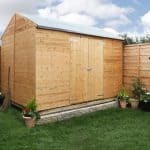 We had a good rummage around the internet and found that you can actually get one of the smaller 5 x 2.7 storage sheds for a little over £200, which considering how well these are made and how long they will last, we do not feel is too out of line at all. These are the kind of products for you people who are willing to spend that little bit more money in order to have a shed that is going to last you many years, be easy to install and in general not cause you any kind of issues as time goes by. When it comes to some of the larger products in this line, such as the larger sheds and the garages, once again we feel that the asking prices we have seen online are very fair. 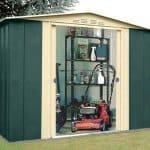 For example, one of their larger items is their Absco 10 x 20 Green Metal Workshop Garage which costs under £1000, which considering the high quality and size is a price we feel is very fair. For those looking for a large storage shed that would double as a workshop, then they have a 9’10 x 12′ Absco Regent 5PE Green Metal Shed that costs £599.99, which is a very fair price for a shed of this quality and size. So in all while Absco Sheds are a little more expensive than similar sized wooden sheds, we feel that the asking prices for their products are still very fair. Absco Sheds: How Customisable Are Absco Sheds Products? As these are made from super strong steel of course you are going to be limited when it comes to customisation. Many of the sites we looked at that sell these products such as Shed Store do offer extras like tools and work benches, but when it comes to things like changing the colour, adding windows and things like that, then there is not anything you can change in that regard. The only official Absco extra that we found was a snow frame that you can add. The idea of this is that it makes the shed or garage even stronger and able to take the weight of an immense amount of snow, but to be honest we feel these products are strong enough as they are. While Absco Sheds may not be as readily available here in the UK as some of the other brands, we highly recommend that if a long lasting, low maintenance shed is what you are after, you take the time to find one. There are a few stores such as Shed Store that have a decent selection of Absco Sheds, but we really hope more and more retailers will start stocking these products as we are very impressed.